To celebrate the spirit of 70th Independence day, GL Bajaj unfurled "The Tallest & The Biggest" National Flag in Greater Noida on August 13, 2016. With traditional gaiety and fervor the inaugural unfurling was done by Dr. Mahesh Sharma, Honorable Minister of State - Ministry of Tourism & Culture. Esteemed Guest Dr. Mahesh Sharma, Honorable Minister of State - Ministry of Tourism & Culture , Dr. Ram Kishore Agarwal; Chairman,GL Bajaj Group;Shri Pankaj Agrawal; Vice Chairman,G L Bajaj Educational Institutions; Shri. 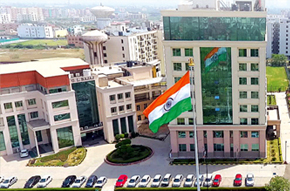 Manoj Agrawal,Secretary GL Bajaj Group and Dr Urvashi Makkar , Director General, GLBIMR hoisted "The Tallest & The Biggest" National Flag of greater Noida at GL Bajaj premises.